These Coconut Bread are sweet buns baked in glorious coconut milk and turn out tasty, delicate and moist. You are going to pull out a piece one after another. While we are rice people at home, I think we are, secondly, bread people. Yes, we consume rice almost every meal. We grew in a culture that eats rice for breakfast which may seem too heavy a meal for most people, but that is how we are. But then again, bread will be another food item that is a staple in our house. Like rice, we can’t be without bread. Either home baked or store bought, there is always a package of bread on our table. We like to snack on bread. We dip it in coffee. We serve it to guests. We also bring it to work. And, we also eat bread for breakfast. Today, we have this home-baked coconut bread. 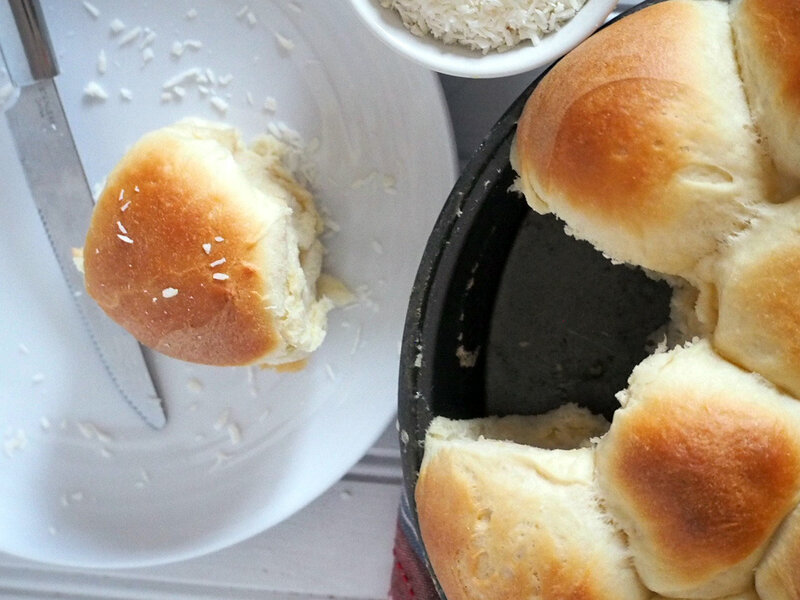 Inspired by a recipe for a bread called Pani Popo, these are fluffy buns cooked in coconut milk. 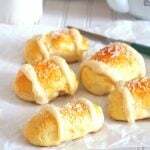 These are sweet and delicate buns perfect for an afternoon coffee, or breakfast. The coconut milk, which is added to the pan before baking, leaves these coconut bread moist and soft. Overwhelmed by the thought of baking bread in a pool of coconut milk? Don’t worry. The coconut flavor is not empowering, rather it has a subtle hint of flavor that imparts sweetness to the bread. Stir together yeast and warm water in a large mixing bowl. Set this aside for about 5 minutes until the mixture is foamy like in the photo above. In a microwave-safe bowl, combine butter, 1 cup of the coconut milk, sugar and salt. Microwave it for a minute or so, until butter is melted and the temperature is not exceeding 110 F. Stir in the egg and the powdered milk to this mixture. Dump everything to the large bowl with the yeast and use a wooden spoon to stir the mixture. 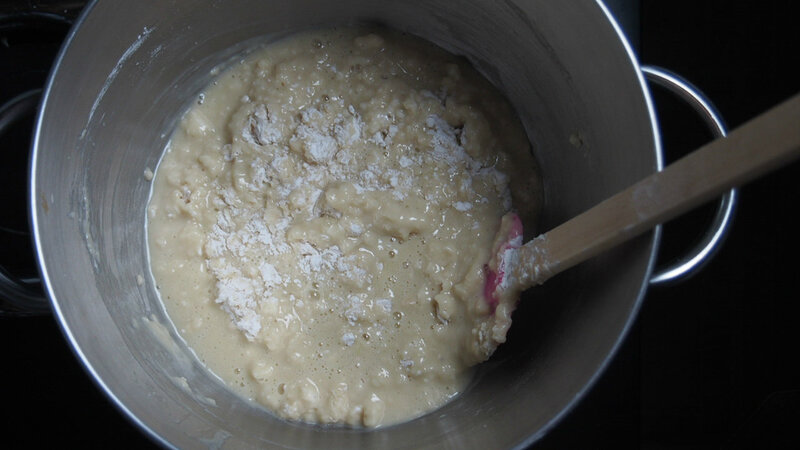 Add 3 and 1/2 cups of flour and stir it into the mixture until incorporated. Then, add just enough of the remaining flour to form a soft dough that gathers in the center of the bowl. 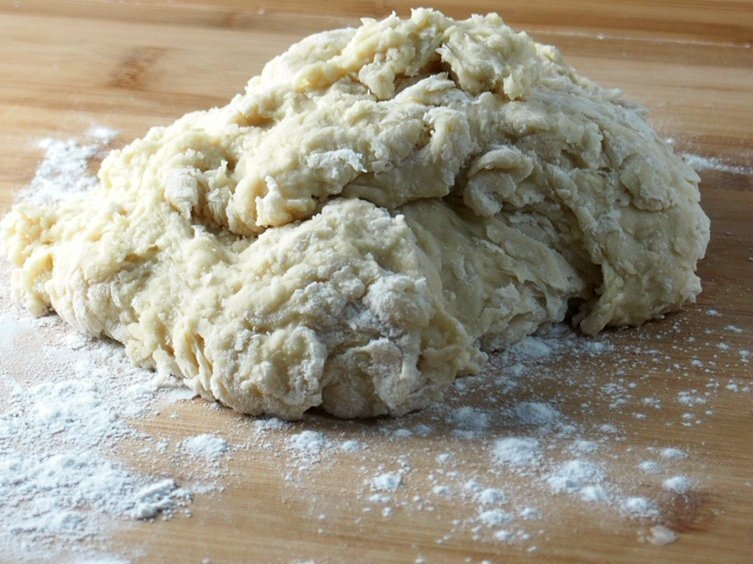 In a floured board, turn the dough over and knead it for 10-12 minutes. New to kneading? 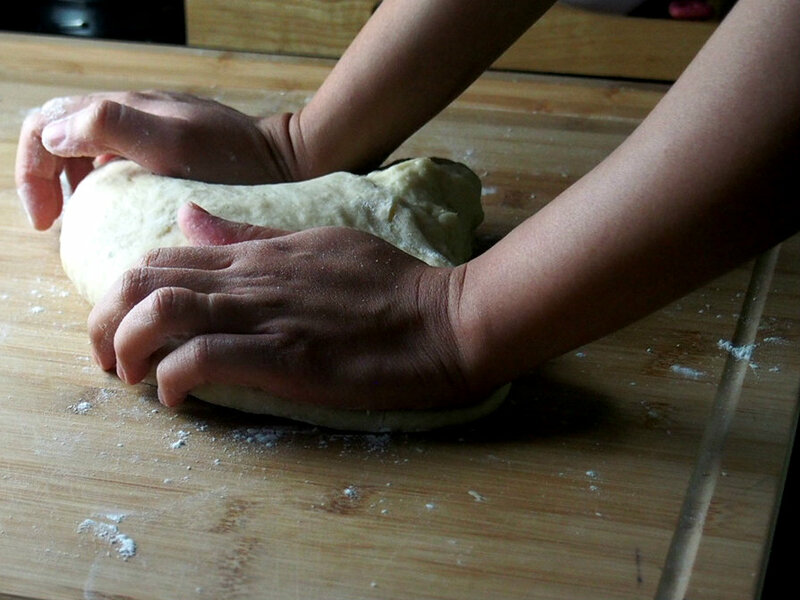 Check out this guide on how to knead bread dough. This article explains it clear and simple. From being shaggy and bumpy, the dough becomes smooth and shiny. The dough is no longer sticky, rather it is a bit tacky. The dough can stretch thinly. Take a small portion, stretch it using your fingers, as if to form a square. There should be a transparent window at the center. See Windowpane Test. 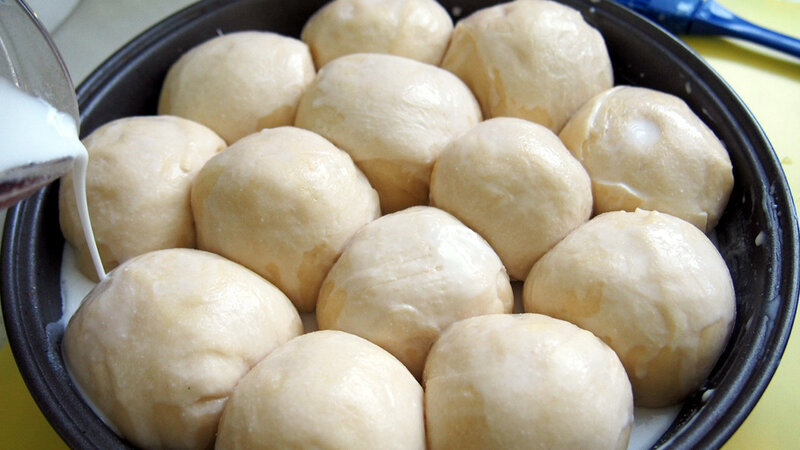 After kneading, shape dough into a ball and place in greased bowl. Cover and let rise for an hour or more, until doubled in size. Punch dough down and divide into 12 equal portions. Shape each portion into a ball and arrange it in a lightly greased 9-inch baking pan. 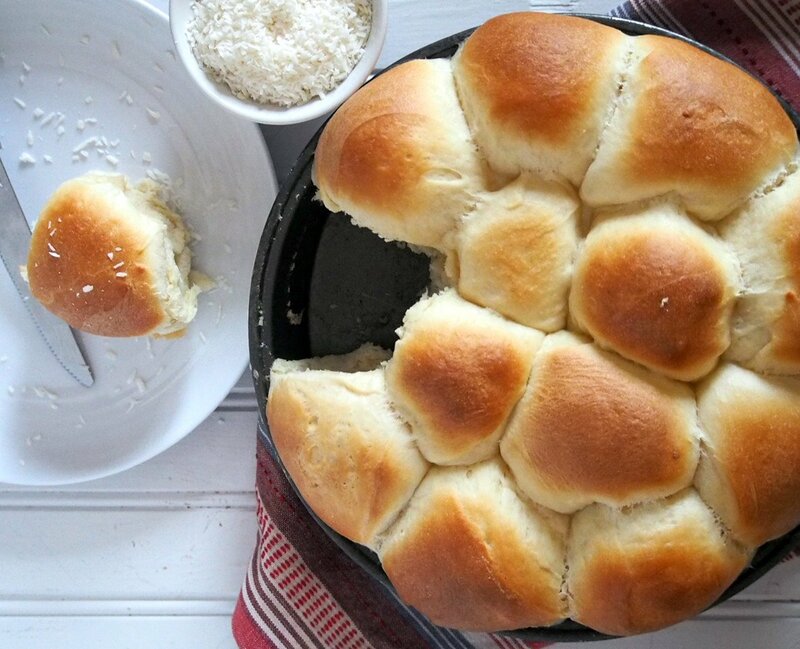 Let the rolls rise, covered with a clean kitchen towel or plastic wrap for 40 minutes, until doubled in size. Preheat oven to 350 F. Brush the rolls with coconut milk and pour the remaining milk into the pan. You might not need all of the milk. Only pour a considerable amount so it does not overflow or spill. Finally, bake it for 22-25 minutes or until golden. Serve warm and enjoy. 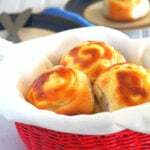 Did you make a bread recipe from the blog? Tag me on my Instagram, Facebook or Twitter. I would like to see! These Coconut Bread are sweet buns baked in glorious coconut milk and turn out as tasty, delicate and moist. You are going to pull out a piece one after another. Combine yeast and warm water in a large bowl. Let this stand for 5 minutes or until mixture is foamy. In a microwave-safe bowl, combine butter, 1 cup coconut milk, sugar, and salt. Microwave until the butter melts but the temperature does not exceed 110 F.
Whisk in the egg and powdered milk to the mixture and stir to combine. 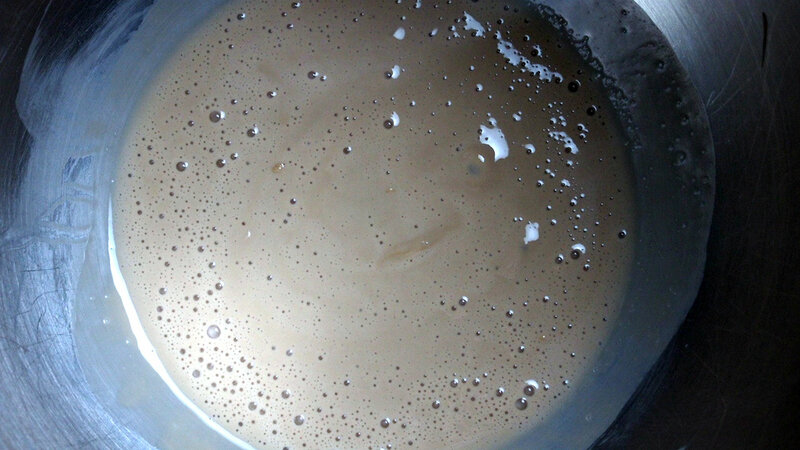 Add the resulting mixture to the bowl with the yeast. Use a wooden spoon to mix the ingredients. Add 3 and 1/2 cups of flour and continue mixing until incorporated. 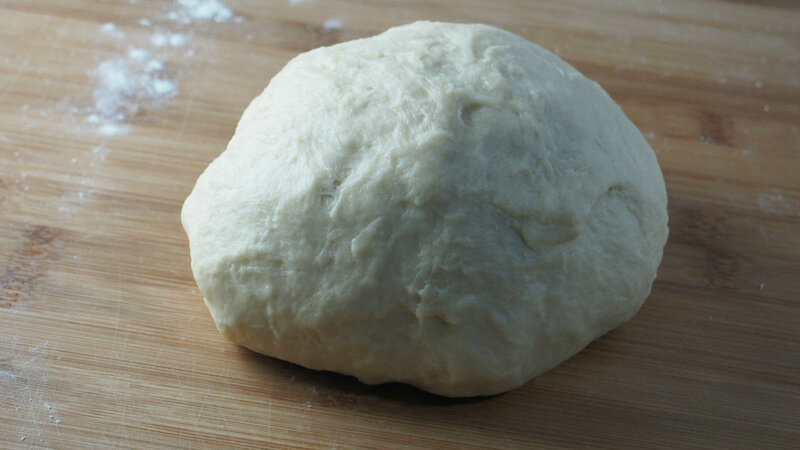 Add just enough of the remaining flour until a soft, shaggy dough is formed. Turn dough onto a lightly floured surface and knead for 10-12 minutes. The dough should be smooth and elastic. Place it in a lightly greased bowl, cover and let rise for 1-2 hours, until the size is doubled. Punch the dough down. Divide into 12 equal pieces. Shape each piece into a ball and arrange in 9-inch round pan that is lightly greased. 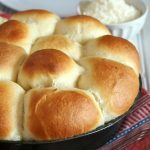 Let the rolls rise for 45 minutes, covered with a kitchen towel or plastic wrap. Preheat oven to 350 F. Brush the tops of the rolls with remaining coconut milk and pour what remains into the pan. Only a pour a considerable amount so it does not overflow or spill. Bake for 22-25 minutes or until golden. Serve warm. 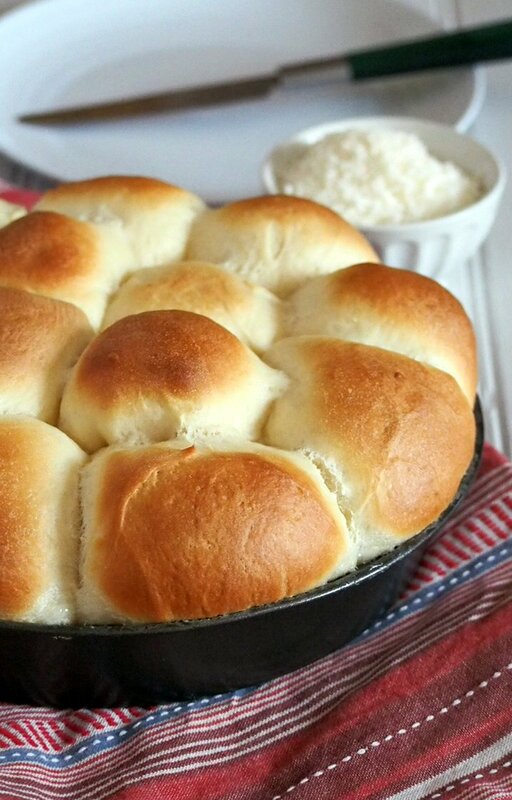 Have never heard of coconut bread, but this looks great. Thanks for the recipe. You are welcome, Jason. You will love these! Can I make it in a normal loaf pan? If so do I need to let it rise a second time after placing it in the pan? Hi Hafsat! I have not tried baking it in a loaf but you can definitely try it! You only need to adjust on the baking time. Also, you need to give it a second rise once you put the dough in the loaf pan. All of the brands I looked at said unsweetened, so I guess that’s what I am using. It says 1 can of coconut milk divided. 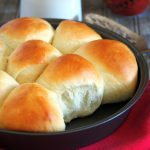 How much is put IN the dough and how much is saved to pour OVER the rolls at the end? I am so sorry and thank you for pointing that out. The coconut milk to be put in the dough is 1 cup, and the remaining is for brushing and pouring over the rolls. Only put enough so that the pan won’t overflow. Thanks and Happy Baking! Hello Sanna and thank you for the recipe. 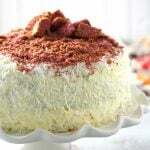 Is it possible to make this without milk powder? May milk be used as a substitute? If so, what measurement would you recommend? Hello Joy! I have not tried replacing the milk powder yet but if you don’t have it, try subbing the 1/4 cup milk powder with 1/4 cup whole milk, then making the coconut milk 3/4 cup only instead of 1 cup. Good luck and happy baking! Thank you! I ended up buying milk powder (yay!). Looking forward to making this bread soon. Thanks, again! Good luck and happy baking, Joy! Thank you so much! How would one do this in a breadmaker? Is it possible? Hello Pero! Unfortunately, I have not tried using a breadmaker so I cannot give exact instructions. However, this is a basic dough recipe and I believe it is adaptable to be made in the bread machine. Sorry! I wish I could help more. This bread tastes delicious! I do have to adjust the backing time or use a bigger pan because the middle rolls were half raw the ones that were fully cooked were amazing! Thank you so much, May! I am glad you liked them!